Summer means more impromptu good times like backyard get-togethers & concerts in the park. 1) Grapes from California. All colors of grapes are a natural source of beneficial antioxidants. Plus, they provide a sweet pop of hydration. I love working w/ Grapes from CA. 2) Multi-seed crackers. Good-for-you crunch w/ fiber, protein & healthy fat. 3) Olive tapenade. Savory & satisfying cracker topping. Plus tapenade = classy. 4) Spicy green beans. Super fun way to eat your veggies. 5) Raw chocolate cookies. A healthy indulgence w/ 4 superfood ingredients & no added sugar. You can find a dietitian close to you…go to http://www.eatright.org & type in your zipcode. Also I have a new 14-day program that may be interesting to you: http://dawnjacksonblatner.com/services/14-day-program/. My program doesn’t focus on calories, it helps you find out what works for your body & what doesn’t by using PHOTO FOOD LOGGING. 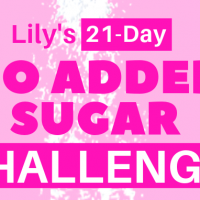 Lily’s Sweets 21-Day NO ADDED SUGAR Challenge!